There is a strange and wonderful disconnect once one leaves Manhattan. It’s as though the city has miraculously disappeared. Get off the L train at Jefferson Street in Bushwick, and you’ve suddenly entered a mythic landscape – nothing like the regimented, urban sprawl of Manhattan. Block after block of abandon industrial brick gyrates with vibrant graffiti – each brick wall more fantastic than the next. The art acts as marker, a signal that you have entered a zone where transformation is a state of mind. During the seventh annual Bushwick Open Studios (BOS), the streets were busy; all the hip new restaurants were packed, and the denizens were raucous. From Friday, May 31st to Sunday, June 2nd, BOS hosted over 600 events including: exhibitions, individual studios, performances, musicians and designers. BOS is a testament to sheer determination; the all-volunteer organization pulled together a massive and complete guide to every single studio and event over the three-day fest. At the “Need a Space? / Have a Space?” webpage for BOS, artists could post a request to share space to exhibit work while just as many venues in the area offered their space to artists. stated they were seeking an “artist to work with us in creating a well-curated show followed by chocolate dance party for BOS. We’re open to various ideas and volumes of art…” Even Bushwick Pet Superette got in on the act, offering up their walls and floor space to installation artists. BOS is an example of a community working in concert at a grass roots level to support and sustain artists. It really doesn’t get better than that. Once one understands the concept, it’s easy to comprehend the passion. 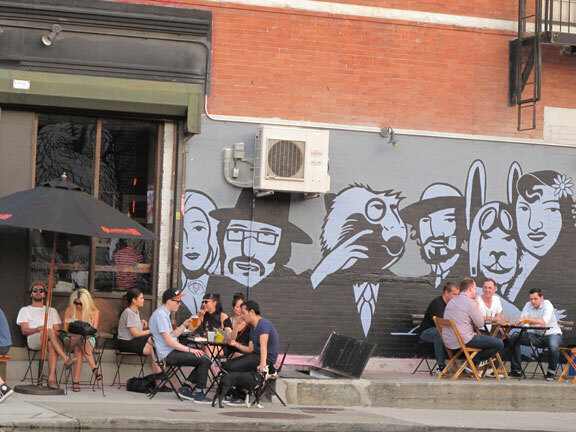 The boundaries of Bushwick, Brooklyn have become acutely defined in the past ten years. Real estate development has exploded and helped to support an influx of artist studios, shops, bars, and restaurants. Old factories have been converted into multiple small studios that house a teaming diversity of artist’s work spaces. Bushwick is the new artist’s haven and with that paradigm shift comes the cold hard fact that Bushwick is quickly becoming unaffordable for the working class or as economics dictates, “the working poor.” This past March Meredith Hoffman of DNAinforeports that rents in the area rose nearly 20 percent. Across the street on Starr Street on Wyckoff the mood is more sedate. Pitched against encroaching gentrification, small bodegas, delis with makeshift seating, 99-cent stores, and run-down residential buildings confirm the remnants of a poor, working class neighborhood. This area is the original gritty Bushwick where the locals congregate, get haircuts at midnight, smoke, eat authentic Mexican food, and converse. These denizens – the ones who occupied Bushwick before the new artistic wave –have their own synergy that provides a resolute counterpoint to the Bohemian scene unfolding just up the street. But it is exactly this juxtaposition that gives Bushwick its verve and resilience. The culture clash is most evident just outside a renovated building on Troutman Street. While the art seeking crowd throng into a converted factory, directly across the street a chubby baby girl sits on the pavement in the midst of several garbage bags and plays contentedly. Her mother looks on – oblivious to the unhygienic stench her daughter sits in. In the 1980s you wouldn’t find Bushwick in a Tourist guide. Bushwick’s working class identity proliferated in the 1950s but by the time of the big blackout in July 1977 the area had become a drug riddled, poverty stricken time bomb. 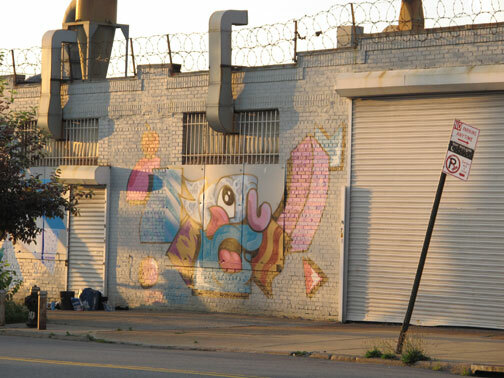 Bushwick – and the South Bronx – were the epicenters for urban blight and failed housing schemes. 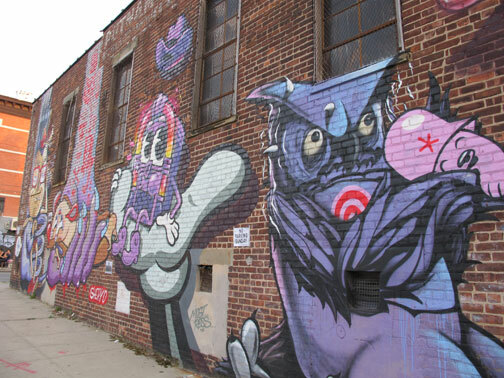 By the beginning of the 1980s Bushwick was a decimated landscape left to decay. At the same time, Ed Koch and Mario Cuomo vowed to rebuild the area. Since then, the paradigm has shifted. The artists that braved the initial blight several years ago are now enjoying a renaissance. As always, where artists tread, real estate follows and Bushwick is no different. 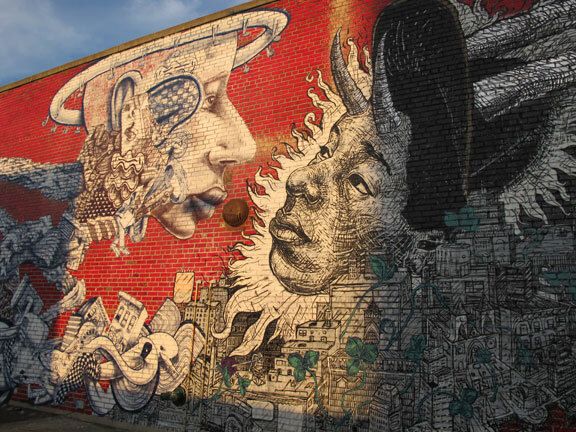 But artists are always the first to embrace change and Bushwick indulges a hugely supportive and well-organized artist community that thrives on transformation. There is a palpable sense of camaraderie and alliance in the austere hallways, small studios, and vacant lots. At 366 Jefferson Street, Norwegian artist Liv Mette Larsen approached her landlord to see if he would be willing to let her clean up the building’s decrepit garage area so she could use the walls to display some of her work. He agreed and she removed reams of scrap and garbage to expose bare, decaying chipped brick walls. 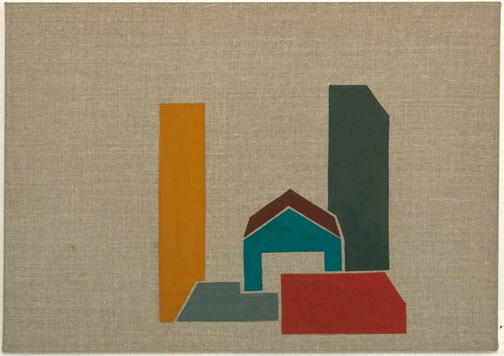 The walls provide the perfect backdrop for her sparse Bushwick skylines rendered in egg tempera on linen. It doesn’t hurt that a forsaken, graffiti-riddled Cadillac also occupies the space and adds to the mise-en-scène of metamorphosis. My landlord wouldn’t once let me once use the backyard of the vacant apartment on the ground floor – despite the fact that the apartment remained unoccupied for six months. Around the corner at 347 Troutman, Brooklyn Brush Studios offers renovated artist work spaces. Capitalizing on the co-working rampage, an old warehouse has been adapted into streamline, clean enclaves with, “wi-fi, diffuse hallway lighting, Central ACand vending machines.” In studio 220, artist Annesta Le’s Joie de vivreis contagious and speaking with her one senses a deep commitment to the nurturing community that she has become a part of. Her bold vision includes neon, expressionism, and an aesthetic that embraces the transformative process that fuels Bushwick’s new ethos. It encompasses an adrenaline charge that only creativity can spur. 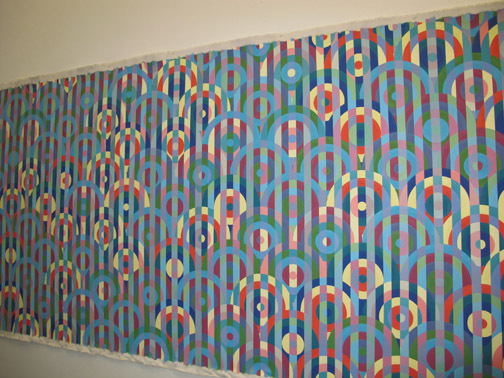 At 1717 Troutman – another renovated factory – artist Daniel Gausman’s intricate and vibrant murals pulsate with energy. He unfurled the beautiful mural that caught my eye only that day, so it was the first time he had actually seen the 16-foot paintingon a wall. Gausman just began sharing the space with another artist – who he has yet to meet. He, like other artists in the converted studios, shares the space. 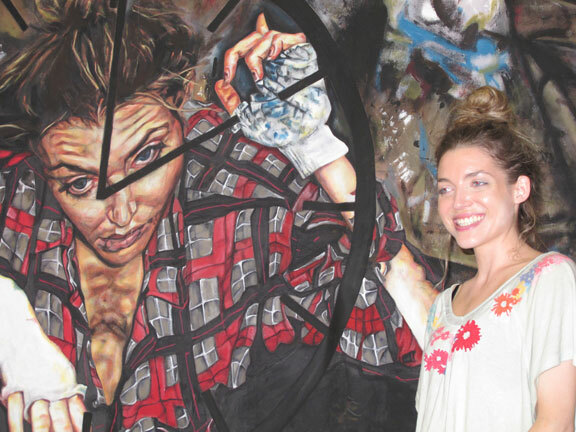 Painter Sonya Berry also shares her space. Berry’s large and graphic human forms are arresting – it’s as if we’ve caught her subjects in the midst of confrontation and the mystery of the narrative draws us in. It’s about 90 degrees in her small studio yet Berry graciously climbs on a chair so that I can get a shot of her with her enormous canvas. In Luis Martin’s studio, we sit on a huge chair with a mouton throw for about 20 minutes – regrouping, talking and relaxing as the artist greets a steady stream of visitors. Martin’s collages are graphic representations that may or may not be immediately identifiable. He deconstructs images we are familiar with and roots them in a vivid gestural landscape. I am reminded of the fractured narrative of Magritte plus the action painting of Pollack. But Martin’s vision is wholly original. The canvases appear to move – to be morphing before our eyes – and this aesthetic is echoed in the title of his mural, Alchemy In Revolution. The title is a perfect moniker for Bushwick as it seeks to define itself as a new creative nucleus. Outside on a rooftop patio, the pit is fired up and hot dogs appear along with cans of beer and waves of conversation. The artists are uniformly engaged with visitors and friends and no one – and I mean no one – is looking at their cell phone or texting. As a matter of fact, I didn’t see anyone checking any electronic device. It was all about the art, about acknowledging the public who had ventured to see their work, about communicating the vast sea change that was unfolding. 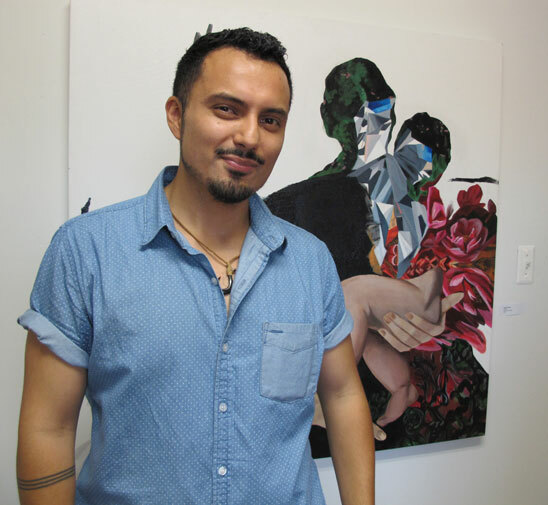 In Luis Martin’s artist statement he speaks eloquently about the “alchemy of being an artist“ and how interpretation becomes a “shamanistic” act. Transformation is an alchemic act – subject to interpretation and prejudice. While art wrestles comprehension from the sociopolitical and cultural shifts of each epoch, there are always those who will refuse to embrace the shamanistic power that communicates raw, innovative ideas. BOS appears as a sheer force of nature – an act of supreme will – transforming the landscape and revitalizing each small space in every crowded, converted factory. I would argue that three days are simply not enough time to view all the artwork and next year, an entire week should be devoted to Bushwick Open Studios– maybe two. 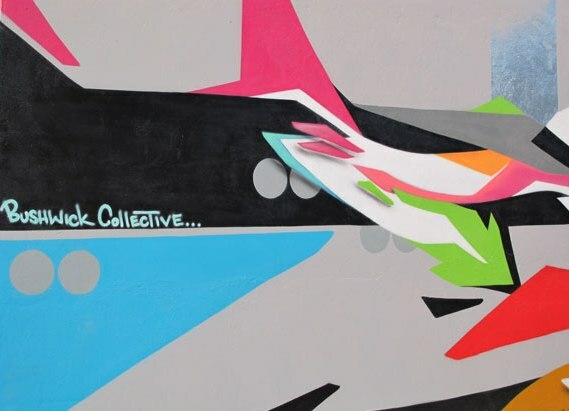 *Editors Note: The first image on this art review was mistakenly attributed to the Bushwick Gallery Collective. It has come to our attention that the gallery wall was created by a single, talented artist Col Wallnuts. We apologize for the oversight.